Aurora Beach Cottage in Tasmania boasts direct beach access and uninterrupted views (Daniel Steiner). Snapper Lodge, Newport – Almost outrageously kitsch, this dream beach house is crammed with cool beachy knick-knacks, has a miniature lighthouse on the deck, and is smack on the water at Newport in Sydney’s northern beaches, with views across Pittwater. From $750 per night for 2-4 nights, $650 per night for 5+nights (high season is a minimum of 1-2 week bookings). Sleeps four. 02 9331 2881. Susan’s Beach House, Broken Head – Light, airy and tropical, Susan’s is the ‘rustic-luxe’ Byron Bay beach house you’ve always dreamed of buying, just a two-minute stroll to stunning Broken Head Beach. From $350 (Sun-Thurs) per night to $450 (Fri/Sat) in low season; or $500 per night (Sun-Thurs) to $600 per night (Fri/Sat) peak season. Sleeps six. 0416 124 797. 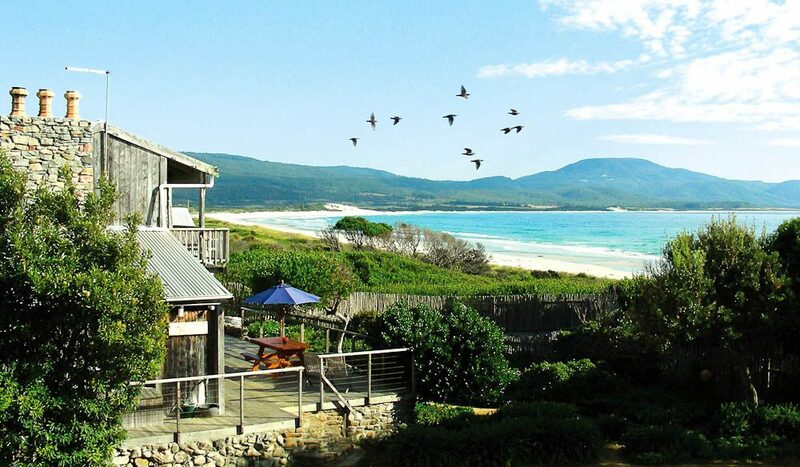 Bear Gully Coastal Cottages, Tarwin, Gippsland – Four private, self-contained cottages in a beautiful setting overlooking Wilson’s Promontory. Throw in a hidden little beach all to yourselves, hammocks, barbecue and log fires for chilly nights, and you’ve got a perfect getaway for families or groups. From $265 per night (midweek) to $340 per night (Christmas period). Sleeps 2-4. 03 5663 2364. Millers Rest, Blairgowrie, Mornington Peninsula – Family-friendly, with all the necessary mod cons (including an open-plan kitchen with Smeg appliances) and outdoor deck, the house is close to several beaches and a 15-minute walk to Blairgowrie village. From $200 per night (low season, two-night minimum) or $2000 per week (high season). Sleeps eight. 03 9775 3325. Koda Beach Bungalows, Mission Beach – Affordable and oh-so-cute, these beach bungalows have everything you need for a chilled-out tropical getaway, including outdoor showers, outdoor eating areas, BBQ and access to a swimming pool. From $165 per night (low season) to $185 per night (high season). Sleeps four. 07 4068 7100. Sunset Villa, 1770, Gladstone – This is classic beach shack living – bright blue walls, surrounded by native trees and flowers, open-plan sleeping and living, and beach views from the verandah. The villa houses two self-contained apartments, so it’s good for groups. From $600 per week (low season) or $1600 per week (high season). Sleeps four per apartment. 07 4974 9990; 1770. Beach Cottage, Dunsborough – This beautifully restored beach house is a midsummer night’s dream, with a gorgeous timber deck under the flame tree providing beach views (there’s direct beach access, too). There’s also a light, bright atrium/living room and the requisite rustic chic vibe. From $433 per night (low season) or $3150 per week (high season). Sleeps six. 08 9750 5444. Lantana Cottage, Albany – Shabby-chic, with whitewashed walls and a verandah providing hillside views out to Middleton Beach, this cottage has a lovely ambience combined with mod cons like a huge plasma TV and iPod docking station. From $860 for three nights (off peak) to $945 for three nights (peak). Sleeps seven. (08) 9750 5444. Beach Huts Middleton, Middleton – Candy-striped and cute as a button (hello, white picket fences! ), these easy-breezy cottages are particularly great for groups of families who want to holiday together. From $150 to $235 per night. Sleeps 2-5, depending on hut (additional fees for extra adults or children). 08 8554 3933. Windsong Beach House, Boatswains Point – With direct beach access, this gorgeously fitted-out abode near Robe on the Limestone Coast has a spa, open fireplace, gas barbecue, laundry and even a doggy snooze area for family afternoon nap time. From $265 per night (low season) to $295 per night (high season). Sleeps six. 1300 760 629. Coast Holiday House, Darwin – This 70s-style, elevated holiday house boasts open-plan living and dining, air-con and ceiling fans to beat the Darwin heat, and views of the harbour and CBD. There are bikes and fishing rods to help you explore the local hot spots, too. From $295 per night. Sleeps eight. 08 8942 3012. Wagait Beach Bush Retreat, Wagait Beach – Set among natural bushland and tropical gardens, this secluded property is perfect for some serious time out (it’s a 128 kilometre drive from Darwin, or a 15-minute ferry ride across the harbour). It’s a great base for exploring this little community, with beaches, fishing, and wetlands on offer – plus, there’s a private pool on your doorstep. From $245 per night. Sleeps four. 08 8978 5123. Paradise Beach House, Boat Harbour – This modern yet cosy retreat boasts bay and beach views, a covered verandah with barbecue for enjoying lazy meals, and a bunch of fishing, surfing, snorkelling and other equipment for you to make the most of this pretty little beachside pocket of Tassie’s north-west coast. From $240 per night (minimum two-night stay) depending on guest numbers. Sleeps 2-6. 03 6445 1390.